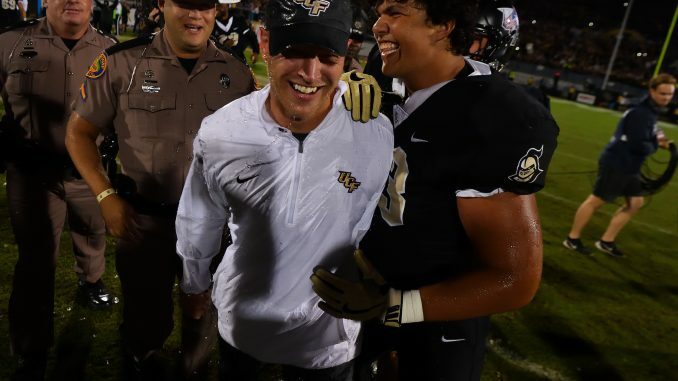 Only two years after arriving in Orlando as UCF’s new football coach, Scott Frost announced that he will be leaving to take the vacant job at his alma mater of Nebraska. Offensive coordinator Troy Walters was named the interim coach for the team’s bowl game. In his two seasons with the Knights, Frost compiled a record of 18-7. He took them from 0-12 in 2015 to 6-7 in 2016 before an 12-0 season this year. In 2017, he had the No. 1 scoring offense in the nation and brought UCF to its highest ranking ever. Earlier this week, he was named the unanimous American Athletic Conference Coach of the Year. The news of his departure comes just a week after he turned down the job at Florida and just a couple of hours after the Knights beat Memphis 62-55 in the AAC Championship game. On Sunday afternoon, the team will learn its bowl destination. UCF athletic director Danny White said that the search for a new coach will begin immediately. Evan Abramson contributed to this report.